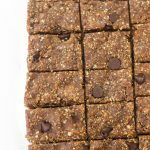 These peanut butter chocolate chip date bars are the perfect thing for your sweet tooth, and they have just five simple ingredients! Place dates in food processor and pulse until dates become a paste. Add peanuts and peanut butter, and continue to process the mixture. Add up to 1 tablespoon of water as needed (depending on the stickiness of your dates and the consistency of your peanut butter) to help mixture come together. Add chocolate chips and pulse several more times to combine into dough. Line an 8x8 or 9x9 inch baking pan with wax or parchment paper. Press mixture into pan and refrigerate for 2-3 hours. Slice into approximately 36 bars. Store in the fridge for up to a week, or freeze for several months.